For sale is the Australian build Boden Temptress 34 currently sailing under commercial Thai registration (6+2) and located in the southern Gulf of Thailand. Due to her function as skippered charter she is constantly cared for and maintained. Last hauled out in November 2015. Her engine rebuild in 2017, just now. She is an ocean cruising sailing yacht made of steel with a fin keel which draws 1.65 meters. She has a Skeg-rudder for more safety while blue water sailing. 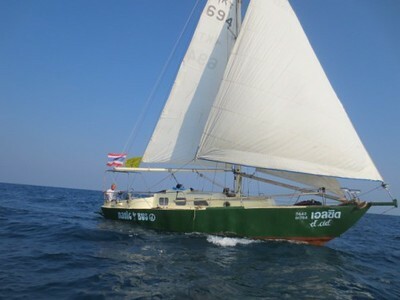 She is equipped with a self tacking head sail for easy single handed beating/tacking and a roller furling Headsail. The mast is a wooden mast. She will be sold with Thai business license but Options to continue her current business are possible too. The Boat is located on Koh Phangan and for the past 3 years we made trips round the island! Now we are selling the boat because times are changing and we are not staying longer in thailand! The boat needs some love and some work but right now we are working on it. The Engine gets a refit, we are taking care of the hull, restoring the wooden parts. The boat will get a now paint coat. Basically we are restoring all important parts of the boat!